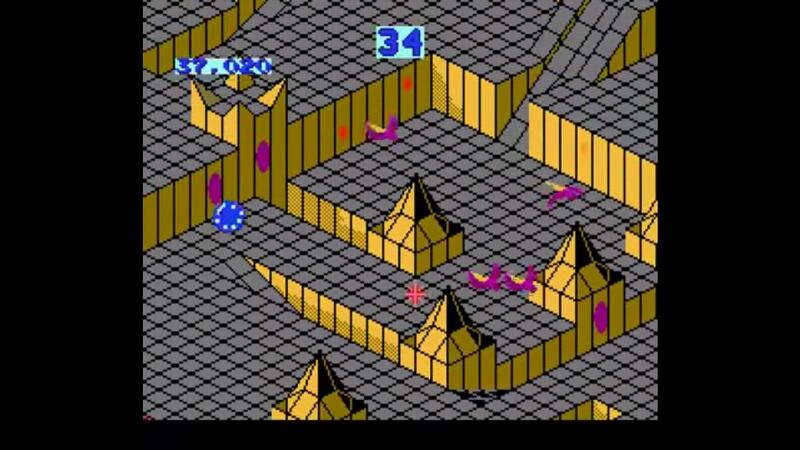 A NES game about marbles? 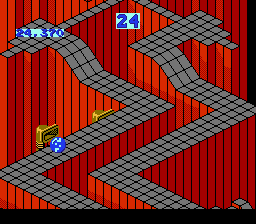 Marble Madness may be one of the most bizarre video games that I own, you play as a marble and the objective of the game is to roll the marble through six different obstacle courses. 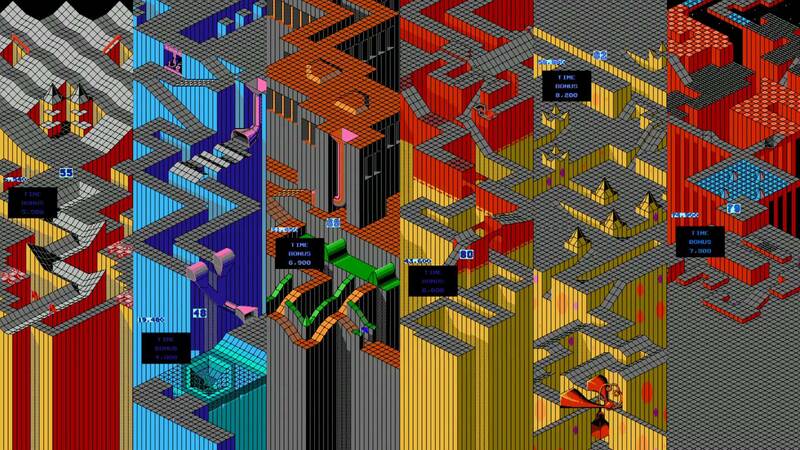 You may think that this seems really easy, but believe me it’s not because the controls are very sensitive, one tap on the d-pad can get your marble rolling and then its up to you to carefully traverse past any obstacles,it genuinely feels like you are controlling a marble and because of that reason the game is immensely difficult, anything can happen you can fall into a dip in the course and then you will need to roll around to build up momentum and speed in order to push yourself back to the flat area, you can roll into acid and melt, you can be eaten by a snake, you can be blown off of the course by powerful gusts of air and you can even spin out of control and smash, and while all of this madness is happening you have a time limit!! 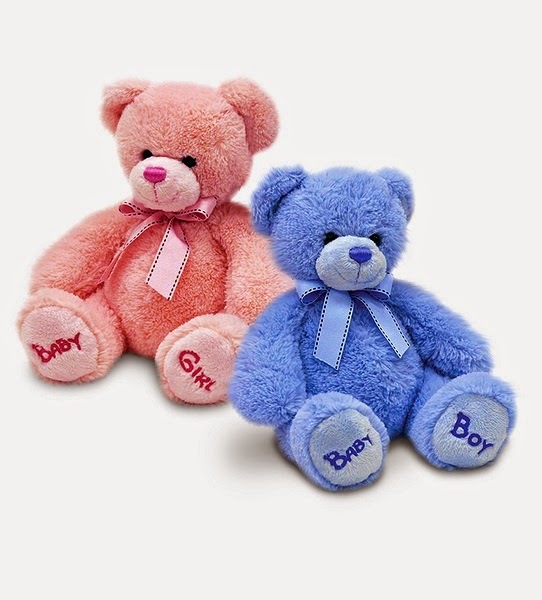 depending on how quickly you finish a course will determine how much time you will be given for the next course and once you hit zero seconds its game over and back to course 1. You have six courses to get through and each course has its own specific design and theme. 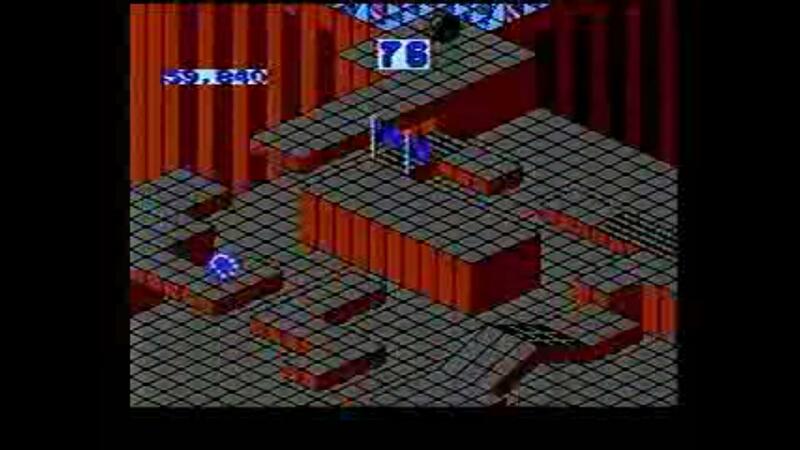 This is literally the practise stage, no obstacles just a good way to get used to the controls by rolling to the goal while trying to avoid falling off of the course. 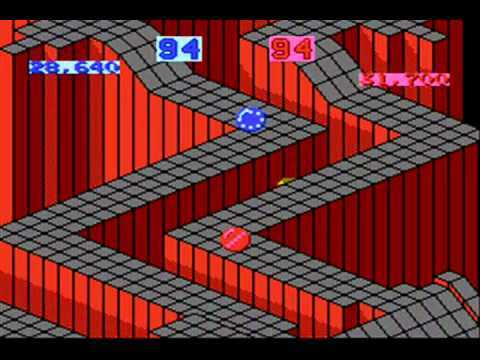 Things start to get a little more challenging here, you will now need to travel through a bigger course than before while avoiding those green snakes who will eat you and also staying clear of the mean black marble that will try to knock you off of the edge. This course isn’t too difficult but it does introduce a new hazard, puddles of acid are now in the game and if your marble touches any of these puddles it will immediately melt, also introduced is a really tough section of the course that requires you to avoid a green wave that will push you off of the edge of the map. 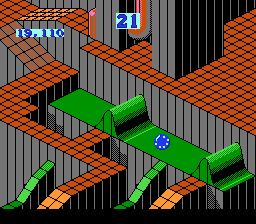 This course also brings back those annoying green snakes and the course in general has many high slopes for you to climb in order for you to reach the goal. When you first start the silly course you are made to traverse up some rather steep hills, this is not too difficult to do but it can cause you to lose quite a lot of seconds if your not quick, you are again having to deal with the green snakes and the black marbles but now they are tiny and because of this they are much less dangerous and you shouldn’t have any trouble avoiding them, a new enemy introduced here is the purple birds, these birds are a pain they show up in a flock right at the end of the course and it is your job to try to avoid them while quickly making your way to the goal, it took me lots of practise before I could finish this level. This is the final level of the game and so as you may expect it is really hard, you need to patience, good timing, fast reflexes and constant movement in order to make it to the goal. You will need to get past puddles of acid, the black marble, and an extremely annoying final section that requires you to carefully travel across many disappearing and reappearing sections of a dangerous path and if you fall your marble will smash. 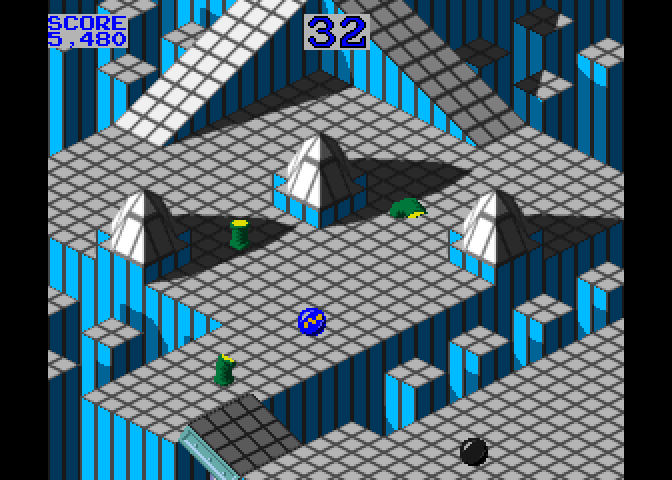 Marble Madness does in fact have a multiplayer mode, if 2 player mode is selected on the main menu, you will need to go through the same six courses from the single player mode, the only difference is that now there are two marbles on the screen instead of just one, Player one (Blue Marble) will need to race Player two (Pink Marble) to the goal, both players will be given the usual time bonus upon starting each course but whoever wins the race will be given extra time on top of the usual starting bonus. 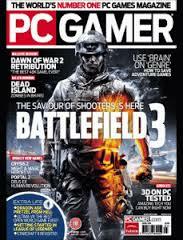 Once you select either singleplayer or multiplayer you will be given a choice of either playing the game in 90 degrees mode or 45 degrees mode. 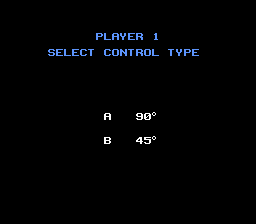 In 45 degrees mode you use all four of the D-PAD buttons but in this mode you need to rotate the NES controller so that the D-PAD looks like an X, some players find this mode easier because while playing the game you will be moving diagonally more often than you will be moving horizontally or vertically. 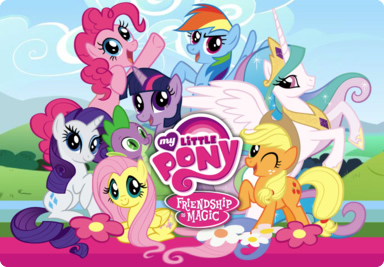 When I played through the game I realised just how brilliant the soundtrack is not only because the music if super fun to listen too but because of how it evolves throughout each course. In the early stages of the game the music is really fun and happy but when you go to the later stages the music starts to get more intense and crazy as if its warning you of the dangers lurking in the later sections of the game. 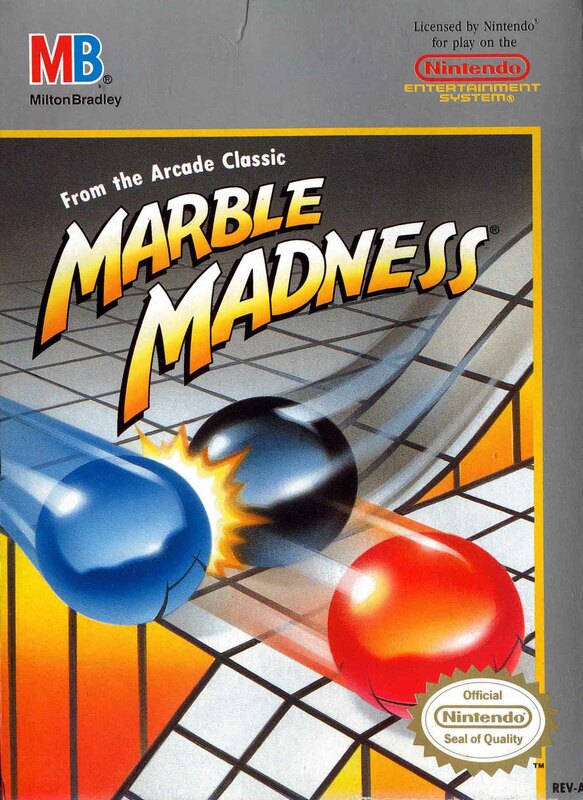 Due to the sensitive controls this game can prove to be very difficult, I see this as positive thing because in reality marbles are round which means that they are very difficult to have control over once they start rolling and also due to their round shape the slightest touch can get marbles moving quite a distance before they come to stop, Marble Madness follows these rules and so it may surprise you that this game is actually quite realistic, its not just the physics based game play that’s impressive its also the way that the music changes with the atmosphere it really helps you feel immersed in the experience and it only goes to show just how special this little game about marbles really is. 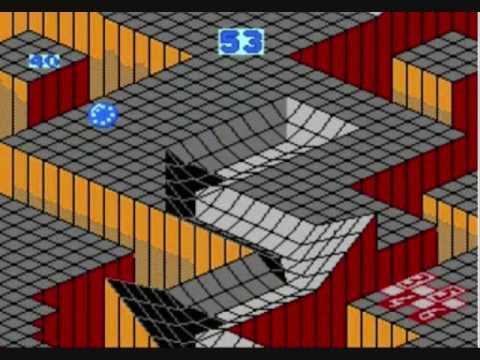 Marble Madness is literally Madness, its a fantastic little game which uses realistic physics, has a surprisingly immerserive soundtrack, the game is challenging but still really fun to play I only wish there was a few more levels and maybe some more options such as changing the colour of your marble and being able to play with more than 2 players on multiplayer mode.